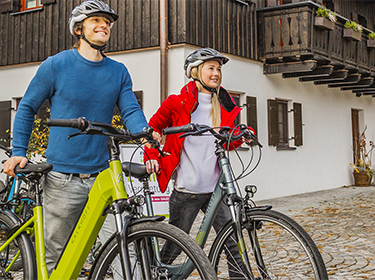 You can try out Kalkhoff e-bikes while on holiday. This means you can take your time, relax, and enjoy a long tour while thoroughly testing the e-bikes. Perfectly equipped for your next bike ride! A small kit of bicycle tools containing suitable wrenches and bicycle repair patches is indispensable on long bike rides. Stowing the small kit on the bicycle is easy and, above all, saves space. Apart from a tyre lever, a mini-pump is a useful tool to have if your bicycle breaks down, and it does not take up much space in the panniers or on the pannier rack. Staying hydrated is essential on a strenuous mountain bike ride. The best solutions here are lightweight, refillable drinking vessels that can be attached to the bicycle. Another practical option is a ‘drinking system’: a water container in the form of a pouch with a tube that can be stowed in your rucksack. Functional clothing is absolutely essential for a successful bike ride in all weather conditions. It is important to bear in mind that the clothing should be windproof and rainproof, as well as being breathable. A helmet is a MUST, whether you are riding your mountain bike or taking a trip though town on your e-bike: helmets save lives! Special cycling gloves will also stop you getting blisters on your fingers and are useful when it comes to cycling in windy and rainy conditions. And don’t forget sunglasses, to protect you from dangerous UV radiation. If you scratch or graze yourself, a small first-aid kit containing bandages and essential medicines can help you enjoy your bike ride to the full, in spite of your minor injury. A bike ride with a lot of luggage and a headwind can turn into a real workout. A balanced diet should therefore be a top priority. This can be supplemented by a power bar with extra protein and carbohydrate to give you even more strength and endurance.